Watchisthis?! Magazine’s Spring Issue out now! Home / Magazine / Watchisthis?! Magazine’s Spring Issue out now! Nothing is more satisfying for us at Watchisthis?! as to get another issue of our magazine out! We always work hard on getting the best possible content and in our modest opinion….we think we succeed to that once again with out Spring issue! One of the great things of making Watchisthis?! Magazine is that you sit down and talk with the most passionate and amazing people. Some head legendary names like Alain Zimmermann of Baume et Mercier, with which we discussed his brands ladies watches (also check out the article on the Petit Promesse! ), or Stephan Obst of Vintage VDB who sold all he had to start making watches in a basement. 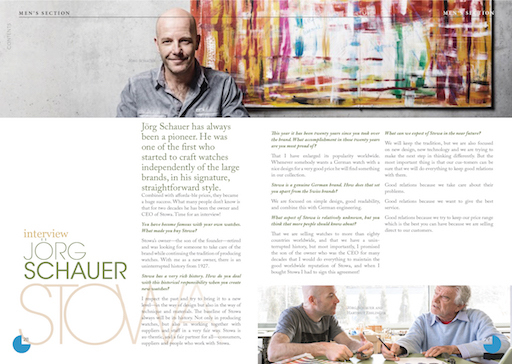 Or Jorg Schauer , who ensured the perpetuating success of Stowa, while people like Janus Aarup from VEJRHØJ and Stephan Trimbos from Stuckx work hard to earn their success for their first products. But we don’t only talk to people, we also visited Casio to see how G-shocks come to life and explore the 6 best travel watches. Big stories, and small stories, underdogs and industry leaders, that is the combination we like! This is also the first issue where we have a full blown ladies section! This section is brought to you by a group of remarkable female editors, located in the world’s center for fashion; Paris, France! In a delightful combination of watches, fashion, food and accessories you secretly get more background information then you would think at a first glance! 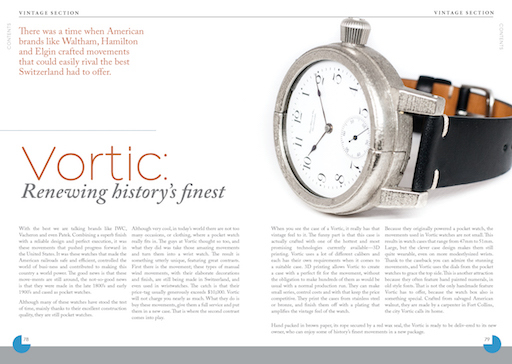 The vintage section has an incredible story on Hamilton Marine Chronometer and Deck watches from WWII, a Cartier you can afford on a budget, a talk with the people behind Vortic, a brand that gives America’s greatest movements a new lease on life, an interesting piece of quartz-history by Girard-Perregaux and much more! 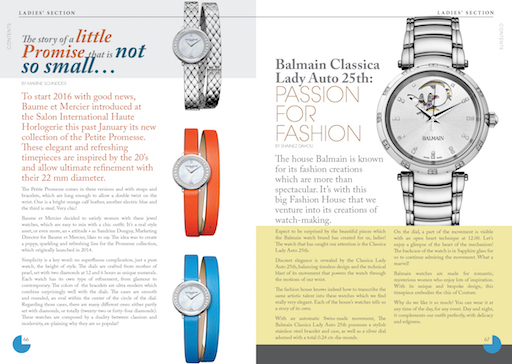 We hope that you enjoy reading the Spring issue of Watchisthis?! Magazine as much as we did making it. As always, you can read it for free on your tablet, eReader, laptop, desktop or smartphone by clicking here or going to www.watchisthis.com/magazine That is also where you can also find all our previous issue’s….and yes, those are also free to read! Enjoy!